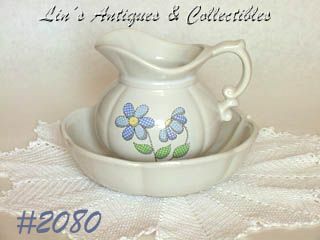 This listing has a beautiful McCoy pitcher and bowl set from one of my favorite lines -- Daisy Delight! Pitcher and bowl are white with blue tinge/cast and the pitcher has gingham flowers on front! Both pieces are marked on bottoms: 7528, McCoy, Lancaster Colony (mark), USA. This set is in absolutely mint condition -- no chips, no dings, no cracks, no crazing -- looks new and unused!